Muraltia heisteria is unknown to many people, yet it has so much potential as a garden plant, bringing colour, texture and charm to the garden. It is not cultivated in Kirstenbosch, but can be seen growing wild on the mountain slopes above the Garden. Muraltia heisteria is a loosely upright, rigid, prickly shrub or sub-shrub, 0.2-1 m high, occasionally up to 2 m. The leaves are small, 5-12 mm long, and densely arranged in little bundles (fascicled). Their tips are sharply pointed, ending in a spine. Young growth and the undersides of leaves are covered in soft hairs, and the margins are fringed with hairs. Masses of small, 7-12 mm long, purple and white flowers are scattered amongst the leaves, mainly during winter-spring-summer (July to December) but also at other times of the year. The fruit is a capsule with four elongated, slender, horn-like outgrowths, and contains two seeds. Muraltia heisteria is not threatened. 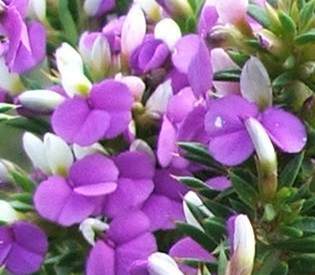 Muraltia heisteria is widespread in the western part of the Cape where it grows on flats and lower rocky slopes, mainly on sandstone, from the Bokkeveld Mountains to Riversdale, from sea level to over 1 700 m. It is common on the Cape Peninsula. This species is extremely variable and contains a number of forms. Muraltia is named after the Swiss botanist J.M. von Muralt. Muraltia heisteria is the type species for the genus, published in the first edition of Linnaeus' Species plantarum in 1753 under the name Polygala heisteria. Botanists have struggled with the genus Muraltia- the species share many characters but have highly variable leaf characters that vary according to their habitat and don't run parallel with the differences in their floral structure, making the leaves useless in separating the various species. 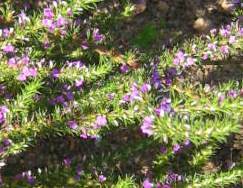 The species were first placed in Polygala but were separated from that genus and placed in Muraltia in the 1760s. There are about 115 species in this genus, all of them occur only in Africa; one species occurs from Tanzania southwards; four occur in KwaZulu-Natal; and the rest are endemic to the Cape Floristic Region, also known as the Cape Floral Kingdom or fynbos, the natural vegetation of the winter rainfall region in the Cape. Muraltia belongs in the Polygalaceae, a family of 80 genera and more than 950 species in most warm and temperate countries. In southern Africa there are 5 genera and 211 species, those best known to gardeners and hikers are Polygala, Nylandtia and Muraltia. Muraltia heisteria is naturally self-pollinated. Levyns (1954) carried out a pollination exclusion experiment where branches, from which all fruits and open flowers had been removed, were covered with translucent paper bags, to exclude the transfer of pollen by an outside agency. The plant still produced fertile seed. The seeds have membranous lobes on either side that may allow them to be dispersed by the wind. 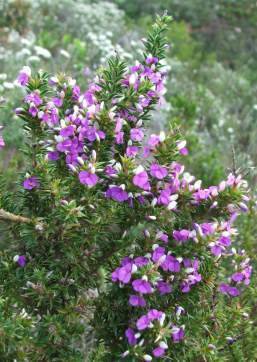 This species is cultivated in Australia where it is known as the furze muraltia. It has naturalized in the coastal eastern suburbs of Sydney and is listed as a weed/naturalized/environmental weed on The Global Compendium of Weeds. Flowering twigs of Muraltia heisteria are used as an appetite stimulant in the Nieuwoudtville area, Western Cape. Two other species in the genus are also used medicinally: M. muraltioides, pyn-in-die-sy-bossie is used for relieving neuralgic pains; and M. lancifolia roots are traditional medicines used in KwaZulu-Natal. Although not well known as a garden plant, Muraltia heisteria is an attractive plant that should do well in most gardens. Being a fynbos plant adapted to nutrient-poor, acidic soils, strong wind, high temperatures and summer drought, this species is perfect for fynbos and water-wise gardens. It can be planted in full sun or semi-shade-plants in semi-shade tend to be less spiny and less rigid. Try it as a low informal hedge, where its prickly nature could be put to use, or use it to bring a splash of bright purple into the garden. Propagate Muraltia heisteria by seed sown in spring or early summer, using a well-drained soil mixture. If sowing in situ in a winter rainfall climate like the Western Cape, sow in autumn to give the young plants time to establish before the dry summer months. When planting seedlings out into the garden, water them well at first to allow them to establish before expecting them to be tough, drought- and wind-tolerant plants. In a winter rainfall climate, plant out in autumn to take advantage of the cool rainy weather and save on your water bill. Muraltia heisteria is currently not being propagated at Kirstenbosch, so we cannot comment on how easily the cuttings root, but it could be propagated by tip or heel cuttings taken during spring or autumn, treated with a rooting hormone and placed in the mist unit. Adamson R.S. & Salter, T.M. 1950. Flora of the Cape Peninsula. Juta, Cape Town & Johannesburg. Levyns, M.R. 1954. The genus Muraltia. Journal of South African Botany, Supplem. vol. 2. Maytham Kidd, M. 1983. Cape Peninsula.South African Wild Flower Guide 3,. Botanical Society of South Africa, Cape Town. New South Wales Flora Online. http://plantnet.rbgsyd.nsw.gov.au. The Global Compendium of Weeds. http://www.hear.org.